Moist. Floodplains, slopes, abandoned fields, forest edges, woodland openings, thickets. Moderately shade tolerant. 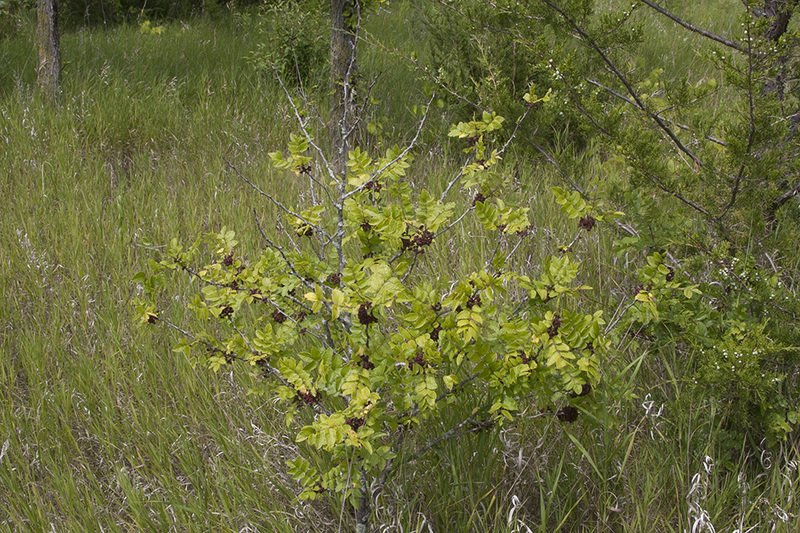 This is a fast-growing, short-lived, deciduous shrub or very small tree rising on a single trunk. In Minnesota mature plants are usually 4′ to 15′ tall and up to 6″ in diameter at breast height, though large individuals can reach over 25′ in height. They sometimes form impenetrable thickets. The branches are stout and weakly ascending to spreading. There is a pair of stout, sharp, about ⅜″ long spines at each node. 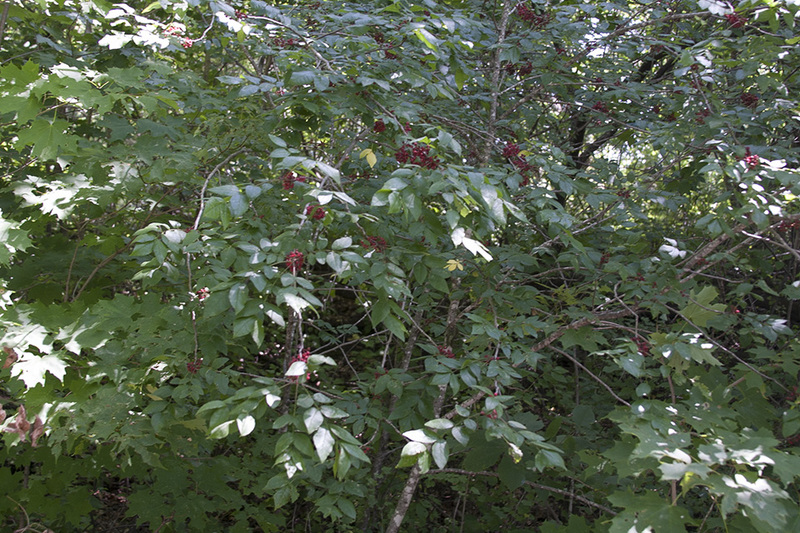 Lower branches tend to persist, even in dense shade. The bark is rough to the touch, gray to brown with darker lines (lenticels), and often with light splotches. 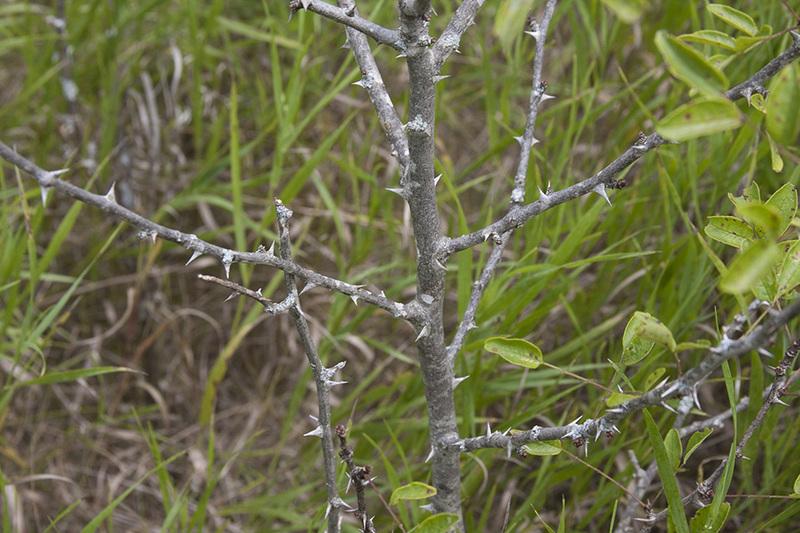 First-year twigs are zigzagged, brown to reddish-brown and sparsely hairy or almost hairless. The leaf scars are have 3 bundle scars. Lateral buds are reddish, ⅛″ to ¼″ long, and clearly visible. They are covered with red, woolly hairs. 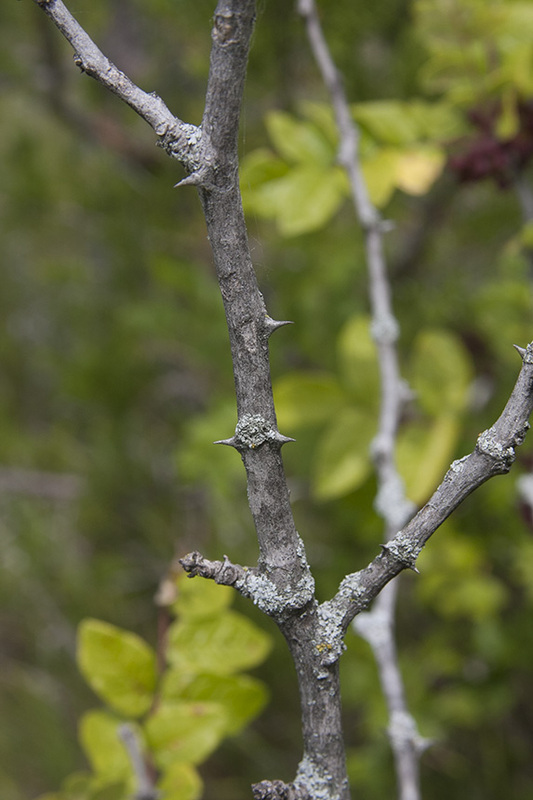 When broken, twigs emit a spicy citrus odor. 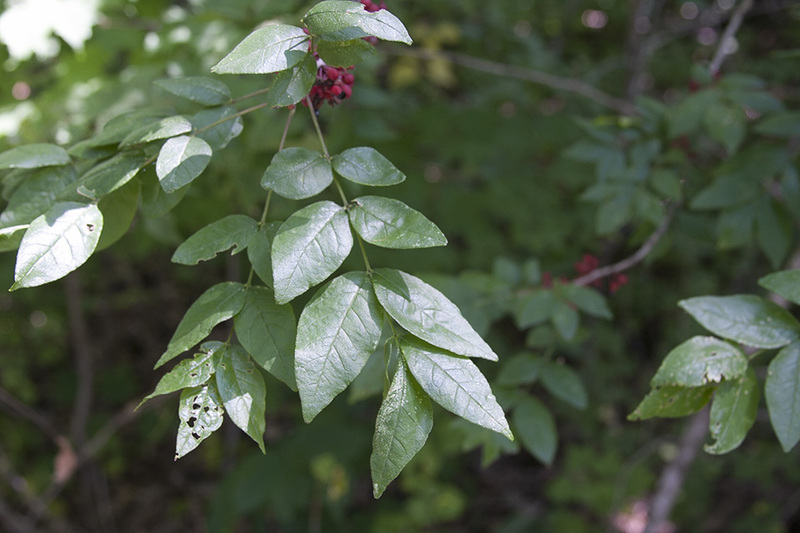 The leaves are deciduous, alternate, 2¾″ to 7⅞″ long, and pinnately divided into 5 to 11 leaflets. They are on ¾″ to 19 ⁄16″ long hairy leaf stalks. The leaflets are oblong to elliptical or egg-shaped, 19 ⁄16″ to 2¾″ long, and ¾″ to 1⅜″ wide. They are on very short leaf stalks, appearing almost stalkless. They are tapered or rounded at the base and taper to a sharp point at the tip. The upper surface is dark green, slightly wrinkled, and sparsely hairy to almost hairless. The lower surface is pale green and hairy. The margins have very small, shallow, rounded teeth and a small yellow gland between the teeth. The leaflets emit a strong, lemon-like odor when crushed. In autumn the leaves turn yellow. Male and female flowers are borne on separate plants. 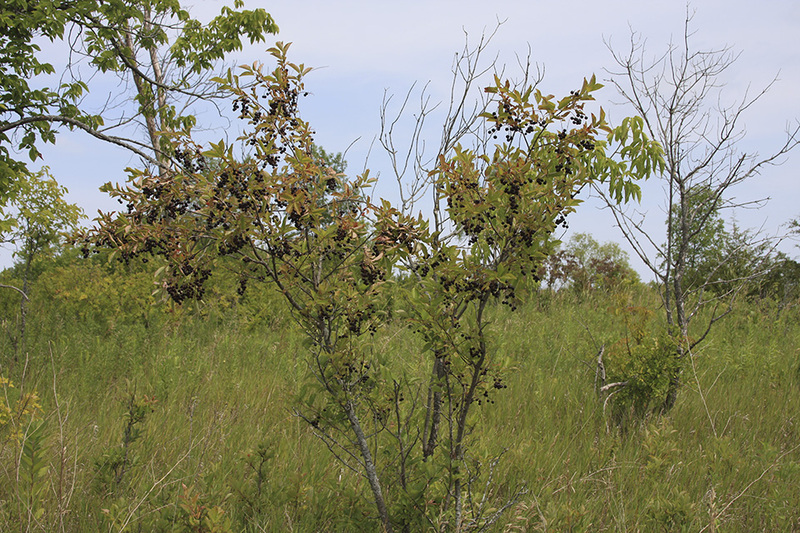 They appear before the leaves in late April to late May in small clusters of 2 to 12 in the leaf axils on previous year’s twigs. They are small and yellowish-green. They have no sepals and 5 minute, greenish and reddish petals. Male flowers have 5 yellow stamens. Female flowers have 3 to 5 green styles. 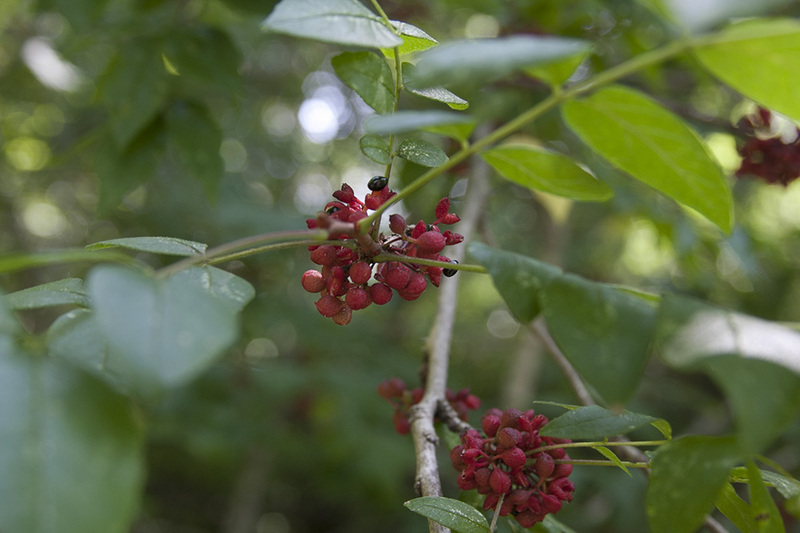 The fruit is a bright red, roughly spherical, 3 ⁄16″ to ¼″ in diameter capsule with a pitted surface. It has a strong lemon or orange fragrance. 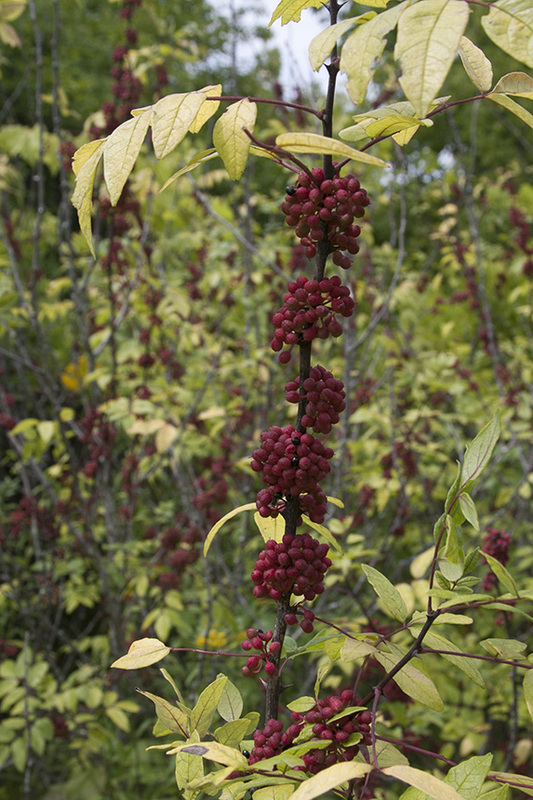 When it ripens in late July to mid-September it splits across the top exposing 1 or 2 shiny black seeds. The seeds are dispersed by animals and gravity. 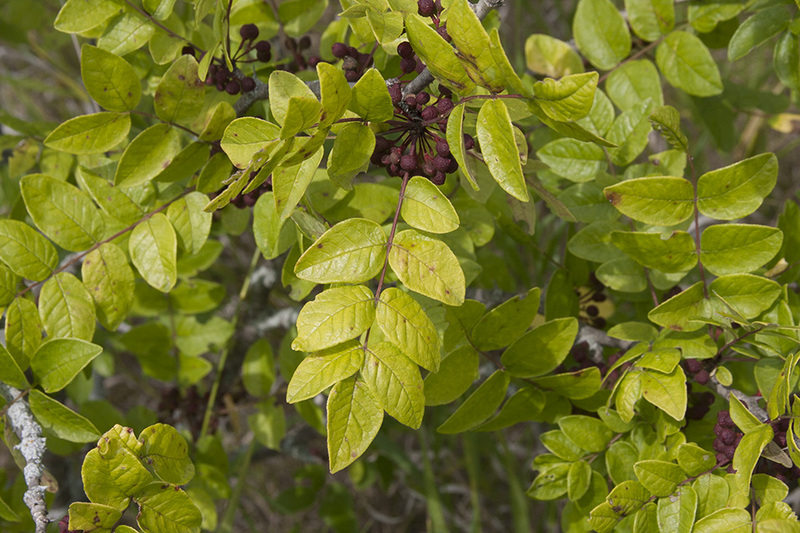 Black locust (Robinia pseudoacacia) is a tree but, when a sapling, can be mistaken for northern prickly ash. Black locust lateral buds are not obvious and are hidden beneath, not above, the leaf scars. The leaves have more leaflets, 7 to 19. The leaflets are blunt to rounded, not pointed, at the tip, and are on short but obvious stalks. The twigs, leaves, and fruit do not emit a citrus odor when crushed. 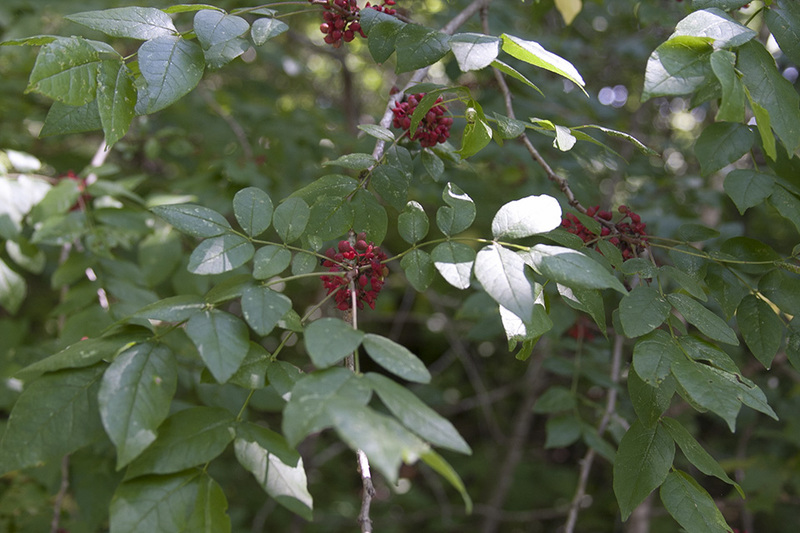 The genus Zanthoxylum should be spelled with an “X” instead of a “Z”. However, it was originally described spelled with a “Z”. Conventions of botanical nomenclature do not allow for spelling corrections. 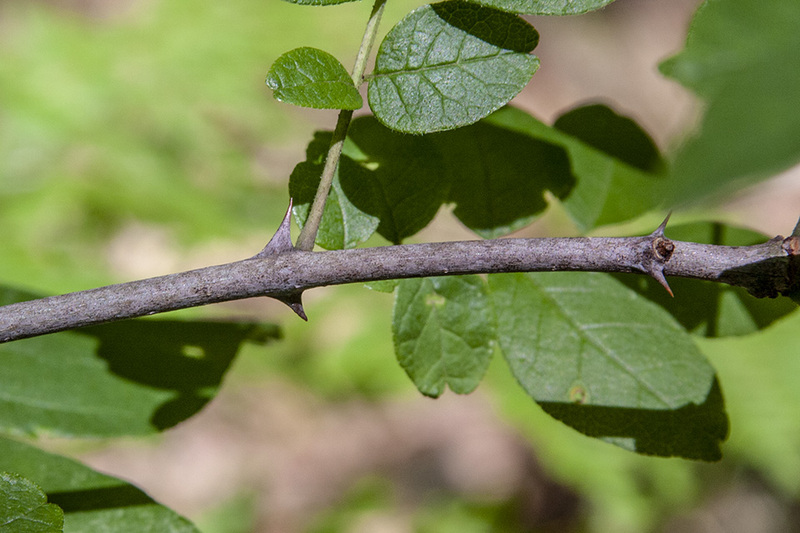 A basic description of Northern Prickly Ash, showing leaf shape and key identifying traits.